In the sequel to the New York Times bestselling memoir Three Little Words, Ashley Rhodes-Courter expands on life beyond the foster care system, the joys and heartbreak with the family she’s created, and her efforts to make peace with her past. A thousand eyes were staring, expectant and ready to listen to me. For some people public speaking triggers a primal fear, arousing the fight-or-flight response, but each time I face an audience I look forward to another chance to be heard. During my almost ten years in Florida’s foster care system I had no voice, even when I had something important—possibly lifesaving—to say. Even more, I was branded a liar because nobody wanted to hear the truth. Since everything I did as a kid became a part of my case file, attempts to discredit my word were written up as official documents and could have ruined any chances I had to be adopted or to lead a normal life. The people who come to hear me speak often have special connections to the foster care system. Among them are parents, judges, legislators, social workers, child welfare executives, and teachers. Sometimes my audience is made up of children or teens who have experienced loss or trauma like I did, or maybe they are young people from more traditional backgrounds and my story shows them what it might be like to grow up without a stable family. Maybe there are people who realize for the first time that children like me are in their midst. Even if my audiences have read my first memoir, Three Little Words, they want to hear me repeat some of the stories and ask me questions. Many are fascinated that someone can be adopted successfully as a young teen. I also defy the stereotypes of former foster youth. I don’t have a criminal record. I’d never been homeless or lived in poverty as an adult. I did not become a teen parent. “I spent almost ten years in foster care, during which time I lived in fourteen different foster placements,” I begin. If there are caseworkers or foster youth in the audience, there are often nods of recognition or nervous laughter. My story is hard to hear, I know—and it’s also difficult for me to recount over and over. My audiences are often well intentioned and dedicated to helping children, but my story reminds them of the crushing impact of their decisions. “After seven years, my mother’s parental rights were finally severed. Even though this was the only way for me to move on, it felt like she had died. I mourned her then, and in some ways I mourn her still—even though she is now a peripheral part of my life. For several years after the termination of parental rights (TPR), or final legal separation, I remained in foster care, eventually landing in a children’s home with a staff that helped me heal. I am one of the lucky ones who finally got out of the system. Even at the awkward age of twelve, the perfect family came forward to adopt me. You would have thought I would have been thrilled, but I had lived in so many hideous homes—including with people who were later convicted of child abuse, molestation, and other felonies—that I didn’t trust anyone to be kind to me, let alone keep me more than a few months. “On my adoption day I was sullen and wary; so when the judge asked if I wanted to be adopted, I mumbled, ‘I guess so’—the three little words that were also the title of my first memoir. “Yet none of the assumptions I made that day turned out to be true. Our family now laughs about the tug-of-war as they tried to welcome me into their fold while I pulled back with all my might. For years, I couldn’t admit—even to myself—that I had left an ember burning in my heart for my biological mother, the person who had smothered me with kisses and called me affectionate names when she showed up for the infrequent visits social services arranged. This part of my speech always gets resounding applause—not for me but for my adoptive parents. I’ve told my story many times, and still the shame of my antics never fades. It’s all part of my life. I don’t like thinking of a time when I was cruel or withholding to someone who was trying to love me—especially after having been on the other side of the equation while I was growing up. But my honest admissions illustrate a crucial point for me. I had no blueprint for healthy relationships; I had no maps or role models. I had to learn on my own that love means forgiveness at many levels. I had been giving different versions of this speech since I was fourteen, but on this occasion my memorized patter sounded hollow. I wondered if anyone sensed that I felt as though I was standing on a precipice with a few pebbles of loose gravel beginning to fall with faint pings down into a valley so deep that I had no idea where they were landing. I have been to the edge many times before—not knowing if I would finally return home to my mother or be shuffled to yet another temporary home run by people who were paid to house and feed me. This time, it was the summer after my senior year of high school, and I was about to voluntarily leave my first real sanctuary for college. All my friends were more than ready to get out from parental control, but my adoptive home was my first real refuge, and I hadn’t really been there that long. I continued to speak, my mind swirling with the paradox of sounding secure while trying to navigate my way through new complications with boyfriends and my birth family. I took a deep breath. Audiences like to feel closure and hear a happy ending, but the reality was that my story was evolving every day. “I’m thankful to the parents and professionals who dedicate their time to helping young people, especially those who assisted me during critical times. Without strong advocates, so many more would fall through the cracks with no one to speak for us.” The audience rose to their feet, clapping. As the sound melted away, the chattering began. The little questions, the small talk, the compliments, and my responses made me seem like I had it all together. If only they knew how nervous I was to be going away to college—or that my biological mother had just emerged from the shadows. My birth mother, Lorraine, once asked my adoptive mother, “When will Ashley get over it?” “It” refers to everything and anything she did or did not do for me. Lorraine saw the past as a door that could be closed. I felt she wanted to pretend we were distant relatives who had just gotten to know each other for the first time and not have to acknowledge all the ways she broke my heart as a child, or all that I endured because of her actions. The dispensation she seeks is not mine to give. I was the baby, the toddler, the frightened little girl who yearned for her mother and believed her when she told me she would return. She said everything would be all right sometime, somehow, soon. Soon turned into a very long time, and “all right” was far different than either of us ever imagined. “Really?” She handed me her phone. The call was brief. When I assured Lorraine that I was thriving and was comfortable in my new life, she told me that I sounded like a “stuck-up Valley girl.” I threw the phone at Gay and ran out of the room before she saw my tears. Once again I had felt a tug from an invisible umbilical cord; and once again it had been slashed by a callous remark. Now and then Gay mentioned Lorraine, not realizing that hearing her name felt like a cheese grater scraping a layer of skin. “You could write her a letter,” Gay suggested. I pretended not to care, but I made her a card. Lorraine wrote back saying she had just married again, and she included some pictures. A few months later she announced that she had given birth to Autumn. The news sickened me because my half sister was born a few days before my birthday and had been given my middle name. This was tough news for me to process. I felt like I had been replaced. Thinking about Lorraine with a new baby reminded me of two other babies that had come after me: the tiny baby who died in infancy and my brother, Luke, whom I endlessly worried about. A few days later Gay picked me up from school. I found it easier to approach her when her attention was directed at driving. “How can they let Lorraine take care of a new baby when her other children were taken away from her?” I asked. “You mean social services?” responded Gay, who had been a volunteer Guardian ad Litem—or CASA child advocate—for almost ten years before she met me. I wanted to shout that I preferred Gay to call her plain “Lorraine,” because it stripped my biological mother of any power over me, creating the distance I needed to protect myself from my own raw feelings. After that, Lorraine faded into the background. When I was a sophomore in high school, Lorraine contacted Gay. “Lorraine wants to see you,” Gay announced without preface. We met at a sandwich restaurant for about an hour. I hadn’t seen Lorraine in almost seven years. Autumn didn’t look related to me. At least my South Carolina cousins had my vivid red hair, but Autumn’s was mud brown like her mother’s. Until I met my cousins and uncle, I had never seen other family members who shared so many of my features. I felt no connection to Lorraine’s voice, mannerisms, or even her smell. Her laughs were forced, her voice ragged from smoking, and she spent more time shooting worried glances at the friend she’d brought to help with Autumn than being attentive to me. “That I would know her—that something would have clicked. It was like talking to a total stranger who happened to know a lot about me.” I turned from Phil because his tender gaze reminded me of what I had not seen in Lorraine’s eyes. I didn’t see or hear from Lorraine for two years after that visit, but as technology changed, she began texting me. I’d given my number to my uncle Sammie—Lorraine’s brother—when he brought his family to attend my graduation from high school. He had suggested that we not invite Lorraine because she wasn’t sober. “Who’s taking care of my sister?” I asked. “Most of the time she’s living with her ‘nana’—an old family friend who watches out for her.” He promised they were in close touch and would step in if Autumn wasn’t safe. Shortly after that, Lorraine texted me: 1ST RHODES 2 GO 2 COLLEGE! By then I’d lived with the Courters more than twice as long as I’d ever lived with her, but maybe, I reasoned, she had been waiting, biding her time until I was an adult to start a relationship. I didn’t know what to expect, but I didn’t need a mother like I once did. The space in my heart I had once desperately wanted her to fill was by then brimming with the love and support of the Courters. I had a stable home and parents and adoptive brothers, Blake and Josh, who loved me and looked out for me. It was difficult to figure out how Lorraine would fit into my life—and easy to imagine all the ways she wouldn’t. 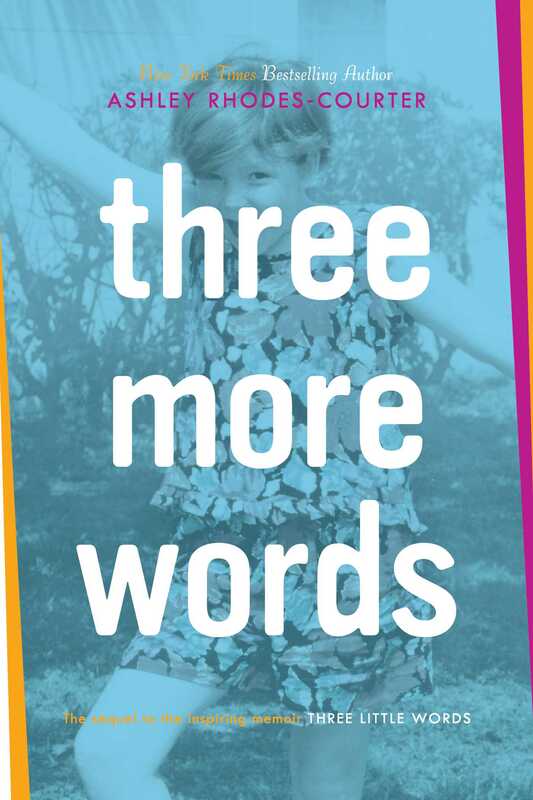 In this sequel to Three Little Words, a memoir about a young girl who lived in fourteen different foster care homes over a period of ten years before being adopted as a teenager, Rhodes-Courter now details her life as a college student and young woman. In this remarkable coming-of-age narrative, Rhodes-Courter forges ahead with her life by building new relationships and establishing a career as a motivational speaker. Haunted by a turbulent childhood, Rhodes-Courter illustrates the healing powers of love and a young woman’s emotional strength, as she shares with readers the struggles she navigated while coming to terms with her past. 1. Having been bounced from one foster care home to another as a child, Ashley is adopted as a teen. Discuss the circumstances that lead to her attending college and her experiences as a college student. In what ways did she grow while in college? What opportunities and insights did college provide? Discuss the people she met in college and the impact they had on her life. 2. Throughout her memoir, Ashley references her mother. Discuss her feelings about her mother. How do her feelings change over time, and what events impact her thinking about her mother? Chapter Seven is called “Divorcing My Mother.” Discuss the impact of this chapter on Ashley’s life. 3. Who is Erick and how does he become a part of Ashley’s life? How does Ashley’s past impact her relationship with Erick? How does Erick respond to her turbulent background? 4. Ashley learns that her uncle Sammie is to be released from prison where he was held for second degree murder, and the family is holding a welcome home party for him. She decides to attend. Why do you think she agrees to go? Why does she take Erick? What impact does this visit have on her? 5. Ashley has a half sister named Autumn. Discuss their relationship. How does it change over time and what factors contribute to this change? 6. Having had a chaotic childhood, Ashley does not trust others easily. In what way does she feel vulnerable? What experiences help her learn to trust? 7. Describe Ashley’s wedding. Why do you think she chose the title “My Splashy Wedding” to describe the event? What impact does her mother’s behavior have on her? 8. Ashley details her struggle with her weight. How does she realize she is overweight? What factors does she contribute to her weight gain? What decisions does she make to take charge of her health? 9. Why do Ashley and Erick choose to become foster parents? Describe the process they go through in order to be eligible. Discuss their experiences as foster parents and how it has greatly impacted them, particularly Ashley. 10. Ashley writes, “My strength turned out to be talking to the moms who were considering surrendering their children for adoption.” Why did Ashley view this as a strength? 11. Ashley cares for a number of infants and children and gives birth to her own son, Ethan, and another son, Andrew. Discuss how she first comes to know Skyler and why she wants to adopt him. 12. During the adoption process, Ashley made many lifelong friends and received help from dedicated professionals. In her closing paragraphs to this sequel, she writes, “I no longer fear the unexpected.” Discuss her growth from a child who feared the unknown to a young confident woman, empowered to care for herself, her family, and others around her. 1. Conduct a short investigation of the foster care system in your community. What processes are in place to care for children in need? What steps do individuals need to go through to be screened and trained to provide care for children in the foster care system? Discuss ways in which you and others you know can contribute to the needs of children in the foster care system. 2. Compile a list of community resources that can be shared with parents, other family members, and the community that provide information to help children in need. Develop an online website and/or brochure using this information. 3. Develop an annotated bibliography of ten or more nonfiction books, memoirs, fiction, and film that address children in need—children living in foster homes, abusive environments, and/or poverty. Prepare one resource from your annotated bibliography and deliver a book talk to the group. What compels you to identify this additional resource? Why is it an important contribution to the literature on children in need? Composition Ideas: A) Think of a time when you felt lonely and compose a short narrative, poem, or essay expressing your feelings. What helped you work through this challenging time? B) Identify a place where you go for solitude, and compose a narrative, poem, or essay describing this place or the impact this place has on your emotional well-being. You may wish to draw or paint a picture. Guide written by Pam B. Cole, Associate Dean and Professor of English Education and Literacy, Kennesaw State University, Kennesaw, GA.
Ashley Rhodes-Courter has been featured in Teen People, The New York Times, USA TODAY, and Glamour, as well as on Good Morning America. Her first memoir, Three Little Words, began as an essay, which won a writing contest for high school students, and was published in The New York Times Magazine. She is also the author of Three More Words. 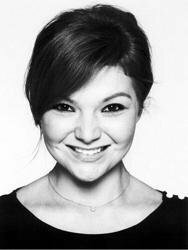 A graduate of Eckerd College and a champion for the reformation of the foster care system, Ashley speaks internationally on foster care and adoption. Visit her at Rhodes-Courter.com.